New Delhi July 13 (IANS) Defence Minister Nirmala Sitharaman said on Friday that India would go head with the proposed purchase of five Russian-made S-400 Triumf advanced air defense systems despite US sanctions against Moscow red-flagging the deal for which an agreement is almost ready. She didn t give a specific time for concluding the $5.5 billion military deal for the Triumf interceptor-based missile system -- billed as a game-changer for India s ability to counter ballistic missiles and stealth aircraft like those China is developing. "It is almost at the conclusive stage. It will happen soon. 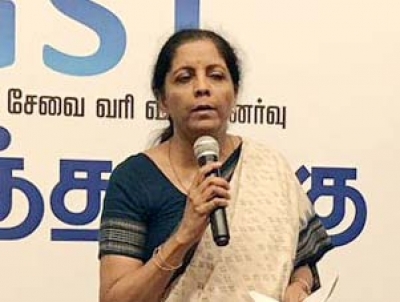 But when it is going to be finalised I can t say " Sitharaman told reporters about the much-awaited procurement of the long-range surface-to-air missile defence system. Asked if the US sanctions targeting Russia for its purported interference in the 2016 presidential election process would impact India s military purchases the Defence Minister said Countering America s Adversaries Through Sanctions Act (CAATSA) was an American and not a UN law. "Of course it does not (apply to India) " she said replying to a question. "It is not either or for India between the US and Russia." "Our defence relation with Russia has endured several decades and we have conveyed about it to a US Congressional delegation which visited India recently." She said India had made its clear to the US that defence cooperation with Russia was a time-tested relationship. The US has openly expressed concern regarding the S-400 missile system being acquired by any of American partners including India. US Congressmen Republican Mac Thornberry Chairman of the House Armed Services who was in India in May said if New Delhi went ahead with the purchase it would complicate "our ability to work out inter-operability" at a time when the US had issued sanctions against Russian oligarchs and companies. These include Rosoboronexport the state-owned Russian weapons trading company. India s deep military and strategic ties with Russia date back to the beginning of the Cold War even as New Delhi led a movement of "non-aligned" countries that declared their tilt with neither Washington nor Moscow. However India always leaned toward the then USSR. India still buys over 60 per cent of its defence equipment from Russia. At present the Indian armed forces are 70 per cent equipped with Soviet or Russian weapons. India and Russia signed an agreement for the purchase of the missile system in 2016 . About the Fifth Generation Fighter Aircraft (FGFA) programme deal between India and Russia Sitharaman said India had decided to withdraw from the programme after its preliminary stage was over. But the door has been kept open so that India can return to the collaborative programme in which India s state-owned Hindustan Aeronautics Limited (HAL) was the lead developmental agency along with Russia s Sukhoi Design Bureau. The two countries had discussed the FGFA since 2007 to develop and manufacture the fighter under an estimated $8.63-billion deal.